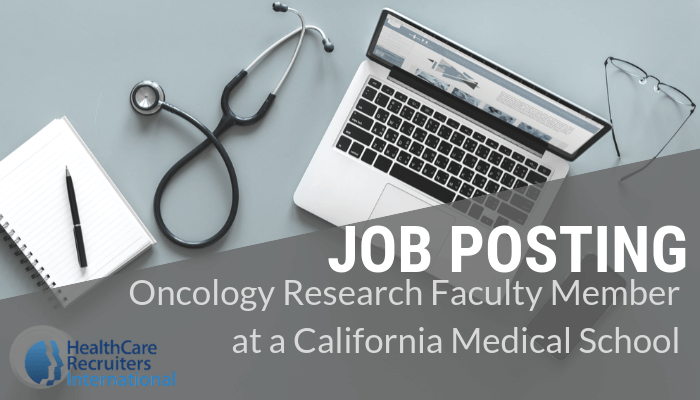 HCRI has recently been engaged in an exciting search for an Oncology Research Faculty Member by a prestigious medical school located in California. This unique position presents an excellent career opportunity for exceptionally qualified candidates. This position features a wide range of responsibilities, requiring a specific set of qualifications. Qualified candidates should possess the following qualifications. Engaged in oncology clinical translational research with a record of high impact publications and extramural funding. Focused on clinical care of patients and research related to the solid tumor in any of the following specialties: breast, GI, thoracic or early phase therapeutic development. Potential to grow into a leadership role within the Universities Division of Hematology Oncology and/or Comprehensive Cancer Center. Demonstrated ability to build research teams and conduct collaborative science. Our client is a renowned medical school with a reputation for their unique multi-disciplinary facilities. Benefitting from access to Stateline funding, the medical school is in the top 20% nationwide for funding and the hospital was recently elevated to Best Hospital ranking. This position is perfect for career-focused individuals looking for an exciting opportunity to conduct meaningful and high impact cancer research. With state-of-the-art facilities, a blend of research concentrations, and strong funding and support, the program offers limitless potential. The program is committed to making the best hire and is offering a highly competitive compensation and benefits package for this position.